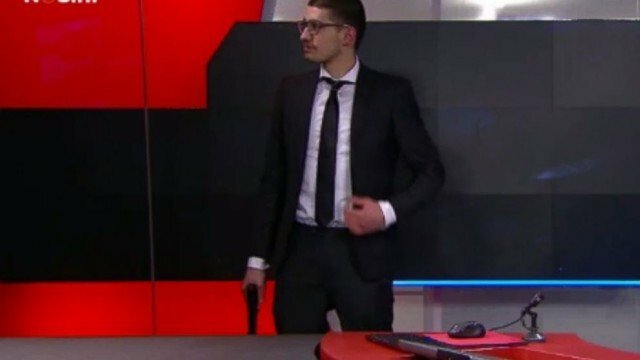 A man carying a gun has been arrested in the studio of Dutch news broadcaster NOS after disrupting the main evening news, reportedly demanding airtime. Staff were evacuated from the building in the Media Park in the central city of Hilversum, The Netherlands. The man, who was well-dressed and carrying a pistol, entered the studio control room, Dutch media report. He was overpowered by a security guard, ANP news agency reports, adding that the gun was fitted with a silencer. NOS director Jan de Jong told Dutch radio that the man had taken someone, thought to be a guard, with him. Jan de Jong added that the man had been detained. At least one helicopter was seen flying over the Media Park. The man had wanted to go to the main evening news studio but instead the guard took him to the studio where daytime bulletins are broadcast, NOS reports. He had a list of demands and wanted 10 minutes’ airtime. No shots were fired, according to the broadcaster. Controversial politician Pim Fortuyn was shot dead in the Media Park in 2002 after giving a radio interview.